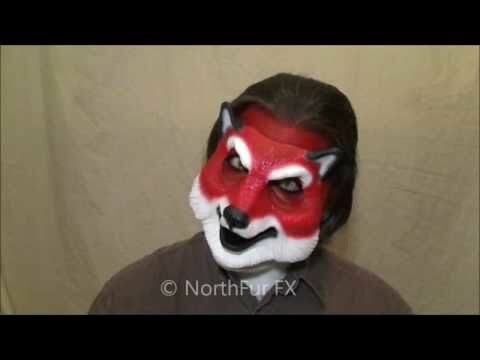 This is the Lyonshel® Fox / Wolf Face. This prosthetic mask was made to fit most faces. Like other Lyonshel® masks, this piece is only available in hot foam latex. Visit our FAQ for information about hot foam latex. This Lyonshel® Fox / Wolf Face has an attached brow and extends far onto the face compared to our own muzzle-only pieces. It has scruffy cheeks, a small slender muzzle with a few teeth in front as well as ears on its forehead. It can be finished as any canine species, such as foxes and wolves in any color desired. It is one piece and comes unpainted by default. Contact lenses, ears and other prosthetic pieces other than the Lyonshel® Fox / Wolf Face that are shown are not included. Using these types of costume accessories can help accentuate this prosthetic piece's features.